This has become a huge site with lots of information for the promotion of personal and social spiritual development, especially by using the Vedic path. This site has something for everyone interested in Spiritual Enlightenment, Eastern Philosophy, the Vedas, Vedic Culture, Yoga, Hinduism, reincarnation, or life after death. It also deals with traveling to the holy places of India, the science of the soul, understanding God, vegetarianism, global peace, and much more. Was it Originally a Vedic Temple? Here you can find information on the books by the writer, author, philosopher, spiritual practitioner, traveler, photographer, and lecturer Stephen Knapp. He has continuously worked to help spread the profound and genuine spiritual knowledge in the Vedic philosophy in a way so that anyone from anywhere can understand and take advantage of it. 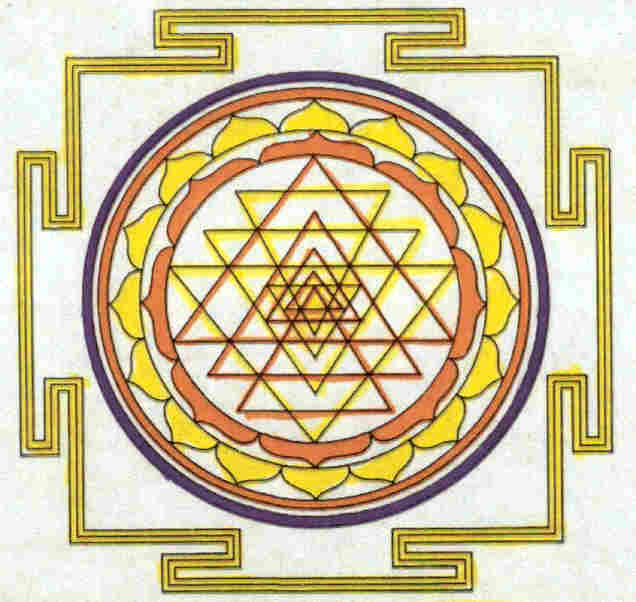 There is a large amount of free information on this site, including numerous articles that will easily and quickly help provide a look into the deeper levels of wisdom and understanding that are available, especially through the ancient spiritual science of the Vedic tradition of India, called Sanatana-dharma. You can also get the insights and knowledge for you to better understand who you are, your spiritual identity, and the real purpose of life from a spiritual point of view. There are also small E-books on Vedic spirituality that can be read online or downloaded onto your computer and freely distributed to others. The deeper aspects of this knowledge is supplied in his bigger books and published at a cost, but many of these are also sold less expensively as E-books. Many additional resources for your spiritual knowledge and development are also supplied on this site. 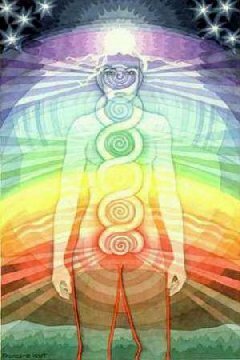 This is an attempt to allow this knowledge to flow as freely as possible for the well-being of people everywhere. Scroll down to find out more. The main purpose of Stephen's work is to offer simple yet accurate ways and explanations to comprehend the lofty insights found within the spiritual philosophy and Vedic culture of India, which has much to offer humanity. So far his intention seems to be working. One of his readers wrote, "You have a rare gift in explaining the complexities of the Infinite and Incomprehensible in attractive words." C. K., from Australia, May 5, 2001. (1) The Secret Teachings of the Vedas, The Eastern Answers to the Mysteries of Life, is an in-depth introduction to the Vedic philosophy and the topmost spiritual knowledge available to humanity. (2) The Universal Path to Enlightenment, an analysis of the major world religions and the spiritual path most recommended for this age. (3) The Vedic Prophecies: A New Look into the Future, Newly Updated & Expanded as of March 2011 with much additional material, This provides a look at what the major Puranas say will happen in the future, some of which is already happening. (4) How the Universe was Created and Our Purpose In It, a detailed description of the Vedic version of the creation of the material universes and life within. (5) Toward World Peace: Seeing the Unity Between Us All, a much needed spiritual message for the present times. This is so important that I have added an ebook edition to this website for free reading and distribution. To read it now online, click here [Toward World Peace E-book]. (6) Facing Death: Welcoming the Afterlife, provides a look at the way death helps us reach our destiny, that it is not a tragedy, and how to view it and use it spiritually to relieve us of the fear of it. (7) Proof of Vedic Culture's Global Existence, said by many to be a must read, offering a view of world history and the importance of the Vedic influence that most books leave out. (8) The Key to Real Happiness, offers the means to attain one of the prime goals of life, genuine happiness. This book and its easy to understand information will show you how to experience real happiness and joy, and reach the spiritual level, the platform of the soul, beyond the temporary nature of the mind and body. (9) Reincarnation and Karma: How They Really Affect Us. This is a short but easy-to-understand and thorough guide in comprehending this complex but basic level of spiritual understanding. For all who wish to learn how their actions affect their future and to determine their own eternal destiny. (10) The Eleventh Commandment: The Next Step for Social Spiritual Development. Based on the Universal Spiritual Truths, or the deeper levels of spiritual understanding, this book presents a new code in a completely nonsectarian way to bring humanity to a higher level of spiritual consciousness that can impact all aspects of our life. 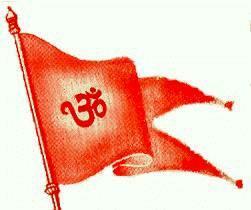 (11) The Heart of Hinduism: The Eastern Path to Freedom, Empowerment and Illumination. This is a definitive and easy to understand guide to the essential as well as devotional heart of the Vedic/Hindu philosophy. This is a complete course in all of its philosophy and meanings that allows you to see and easily put into practice the depths of its wisdom and insights that are contained within this profound spiritual knowledge. (15) Seeing Spiritual India: A Guide to Temples, Holy Sites, Festivals and Traditions: 2020 UPDATE. This is especially for the pilgrim traveler who wants to get the most out of his or her spiritual adventure and experience in India. Contains information on hundreds of holy sites and towns, and many more temples. Describes how to get there, what you will find, and the places to see and the traditions, stories, and meanings connected with them, along with the benefits of visiting them. 16) Crimes Against India and the Need to Protect its Ancient Vedic Traditions. 1000 Years of Attacks Against Hinduism and What to do About it. This book explains the real history of India, and the many invasions and atrocities against it, its people and its culture that have been, and continue to be committed by many invading forces. Also contains action plans and ideas on carrying out ways to promote the profound and dynamic nature of real Vedic culture and how to protect and preserve it if we are going to provide a future for it through the generations to come. (17) Yoga and Meditation: Their Real Purpose and How to Get Started This book explains the benefits of yoga, The real purpose of yoga, The types of yoga, such as Hatha yoga, Karma yoga, Raja and Astanga yogas, Kundalini yoga, Bhakti yoga, Mudra yoga, Mantra yoga, and others; The Chakras and Koshas; Asanas and postures, and the Surya Namaskar; Pranayama and breathing techniques for inner changes; Deep meditation and how to proceed; The methods for using mantras, Attaining spiritual enlightenment, and much more. (18) Avatars, Gods and Goddesses of Vedic Culture, Understanding the Characteristics, Powers and Positions of the Hindu Divinities. This describes the various aspects, symbols, weapons, physical attributes, and some of the legends of the various Divinities of the Vedic tradition. Includes Lord Krishna, Vishnu, Their main avatars and expansions, along with Brahma, Shiva, Ganesh, Murugan, Surya, Hanuman, as well as the goddesses of Sri Radha, Durga, Sarasvati, Lakshmi, and others. (19) The Soul: Understanding Our Real Identity. The Key to Spiritual Awakening. Short and to the point, this book provides a summarization of the most essential spiritual knowledge of the pre-eminent Vedic tradition. The descriptions will give you greater insights and a new look at who and what you really are as a spiritual being. (20) Prayers, Mantras and Gayatris: A Collection for Insights, Protection, Spiritual Growth, and Many Other Blessings. The Sanskrit prayers, Gayatris mantras, and stotras or devotional songs within this volume offer many kinds of blessings, spiritual insights, protection, and the means for further self-development and spiritual advancement. (21) Krishna Deities and Their Miracles: How the Images of Lord Krishna Interact with Their Devotees. 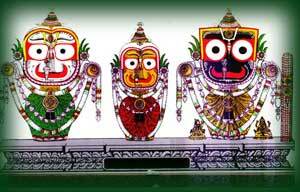 This gives the philosophical and scriptural basis how Deities reciprocate with devotees, plus the antiquity of Deity worship in the Vedic tradition, ancient temples across India of particular interest, and old and modern stories of Deities interacting with Their devotees. (22) Defending Vedic Dharma: Tackling the Issues to Make a Difference: This book takes on some of the most topical issues at present that many do not properly understand about Vedic culture, and explains and resolves them in a way that can help us apply Vedic culture to our lives and help others have a clearer and more positive view of what it has to offer. (23) Advancements of Ancient India's Vedic Culture: The Planet’s Earliest Civilization and How it Influenced the World This provides a detailed description of all the ancient advancements that were developed in the ancient Vedic culture of India and the Indus or Sarasvati Civilization. Much of this is what people are forgetting, or never knew, of how superior this culture was in mathematics, medicine and surgery, ship building and maritime trade, textiles, metallurgy, writing and language, architecture, and many other areas of development, including its spiritual path of Sanatana-dharma. (24) Spreading Vedic Traditions Through Temples: Proven Strategies That Make Them More Effective. This book covers many methods that are not merely ideas, but are already being used in practical and successful ways to help preserve, promote and spread what is the last bastion of deep spiritual truth. As more temples are built in Western countries, these strategies will become increasingly important. Using these techniques as the basis of your ideas, your temple cannot help but be successful. (25) The Bhakti-yoga Handbook A Guide for Beginning the Essentials of Devotional Yoga. This book is a guide for anyone who wants to begin the practice of bhakti-yoga in a practical and effective way. This supplies the information, the principles, the regular activities or sadhana, and how to have the right attitude in applying ourselves to attain success on the path of bhakti-yoga, which is uniting with God through love and devotion. (26) Lord Krishna and His Essential Teachings: If God Were to Tell You the Truth About Life, This is It. This books explains who is Lord Krishna, why He appears in this world, and His instructions about the purpose of life and what we are supposed to do here, and how to use it to make the best use of our situation. This is like the secret knowledge of life that we should all know. NEW (27) Mysteries of the Ancient Vedic Empire: Recognizing Vedic Contributions to Other Cultures Around the World. This book takes us on a journey through history and across many countries as we point out similarities and remnants of the Vedic tradition that remain there to this day. NEW (28) Casteism in India: Is It the Scourge of Hinduism or the Perversion of a Legitimate Vedic System Known as Varnashrama. This book is a short study of what the Vedic texts actually say about what the Vedic social arrangement is really supposed to be and the purpose of it. NEW (29) Ancient History of Vedic Culture: The Time Line of India's Vedic Civilization as Presented by the Tradition. This books explains the traditional views as to the antiquity of Vedic society, its ancient beginnings, how the Vedic texts manifested, and how the Vedic knowledge was given to humanity and spread around the world. NEW (30) A Complete Review of the Vedic Literature: India's Ancient Library of Spiritual Knowledge: This book shows how these many texts fit together, their divisions, the supplements, what information they contain, and their philosophical conclusions. NEW (31) Bhakti-Yoga; The Easy Path of Devotional Yoga: This offers a systematic description of how bhakti-yoga works, the practice and philosophy of it, and how to become successful on this spiritual path. NEW (32) The Power of the Maha-Mantra: This explains by scriptural references what is so special about chanting the Hare Krishna mantra. NEW (33) The Taj Mahal: Its Alternative History as a Vedic Temple: Available only as an Ebook, Contains several papers by noted researchers into this topic as found on this website but as a Kindle Ebook or pdf file. These can be ordered through stores or online at www.iuniverse.com/bookstore, and as adobe E-books that can be downloaded onto your computer, which is especially convenient for those who are overseas. European book orders will be shipped out of England. These books are also available on www.Amazon.com and www.BarnesandNoble.com. Orders from bookstores or catalogs can also be placed through iUniverse by calling 1-402-323-7800 extension 501, or by emailing: book.orders@iuniverse.com. For International orders: Call 00-1-402-323-7800. These are also available through Baker & Taylor Book Distributors and Ingram Distributors. Click on the titles for more details on each book and ordering information. (12) Destined for Infinity, is a highly spiritual adventure in which a Westerner embarks on a mystical quest into the Himalayas and is transported into a new and enlightening spiritual dimension. It relates a man's quest for Truth and shows his journey from a state of confusion to one of the highest levels of enlightenment and self-empowerment. It is a book that will take you to other worlds and unlimited realms. Now also available in India. (13) Vedic Culture: The Difference It can Make in Your LIfe. This new book shows the advantages of the Vedic paths of improvement and self-discovery that you can use in your own life to attain personal spiritual awareness, happiness, and fulfillment. It also provides a new view of what these avenues have to offer from some of the most prominent writers on Vedic culture in the West, who discovered how it has affected and benefited their own lives. 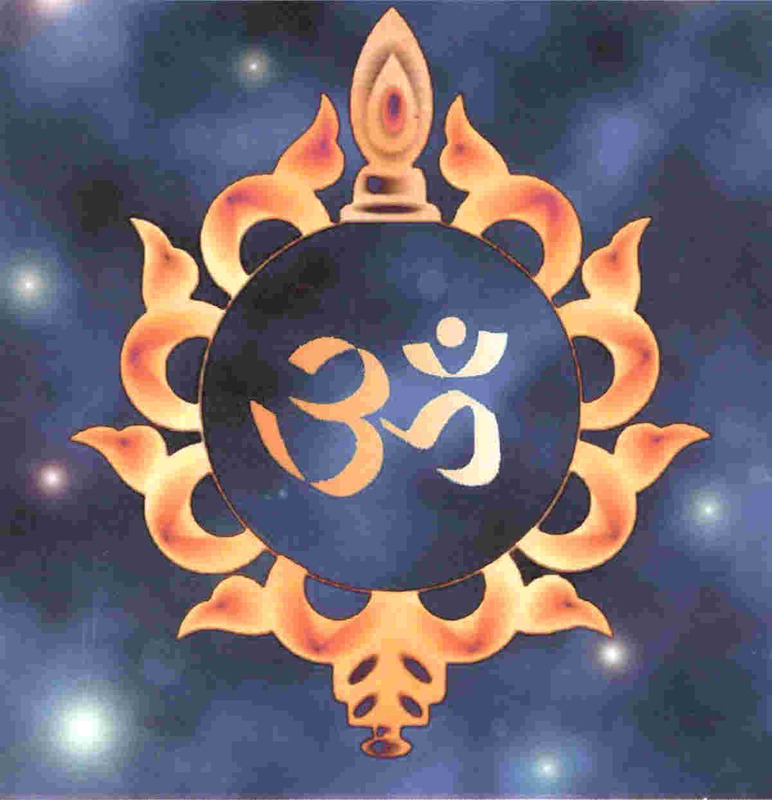 (14) The Power of the Dharma: An Introduction to Hinduism and Vedic Culture. This offers a concise and easy-to-understand overview of the essential principles and customs of the Hindu tradition. It also provides many insights into the depth and value of the timeless wisdom of Vedic spirituality and reveals why the Dharmic path has survived for thousands of years. ALL OF THESE BOOKS are available and can be ordered from us by mail (check the downloadable Order Form), or from www.Amazon.com in the United States and wherever else they are located as listed below, or through your local bookstores if they use the international "Books In Print" database rather than their inhouse database. ADOBE READER E-BOOK EDITIONS for Stephen's books can also be ordered for reading on your computer no matter where you live, from www.lulu.com. Just do a search for Stephen Knapp on their site. To get the latest version of the free Adobe Reader to read the Ebook, use this link: http://get.adobe.com/reader/otherversions/. AND OTHER COUNTRIES AS THEY OPEN. FOR THE NOOK E-Reader: Many of Stephen's books are also available for the www.Barnesandnoble.com Nook E-Reader. Just do a search for Stephen Knapp on their site. 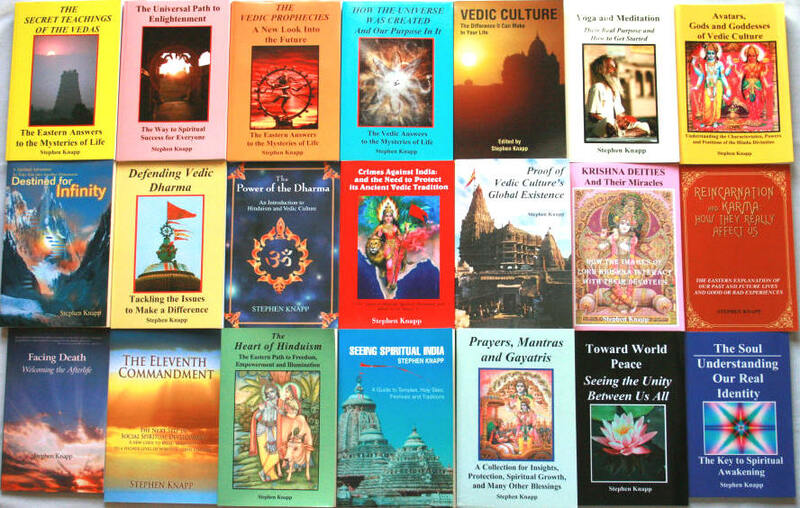 Paperback Books published in India so far include "The Secret Teachings of the Vedas", "Vedic Culture: The Difference It Can Make in Your Life", "Destined for Infinity", "The Power of the Dharma", "The Heart of Hinduism," and "Spiritual India Handbook" (Indian title for "Seeing Spiritual India"). "The Secret Teachings of the Vedas" and "Seeing Spiritual India" (titled "Spiritual India Handbook") as well as "Avatars, Gods and Goddesses of Vedic Culture" (under the name of "Hindu Gods & Goddesses") are available through Jaico Publishing House in Mumbai, email id jaicopub@jaicobooks.com or visit their website www.jaicobooks.com, or go directly to: http://www.jaicobooks.com/j/j_searchtry.asp?selcat=author_name&keyword=Stephen+Knapp. The Indian versions of "The Heart of Hinduism" and "The Power of the Dharma" are available through Rasbihari Lal & Sons, at Loi Bazar, Vrindaban 281121, U.P., India. Phone: 91-565-2442570. Check their website at: http://www.rasbihari.com or use this link: http://www.rasbihari.com/index.php?keyword=Stephen+Knapp&Search=Search&Itemid=1&option=com_virtuemart&page=shop.browse Or email: brijwasi2001@hotmail.com. You can also find the books by Stephen Knapp that are available in India through flipkart.com: http://www.flipkart.com/search-books/stephen+knapp, and also through http://books.rediff.com/book/stephen-knapp. You can also get Stephen's books that are available in India and in the United States at: http://www.infibeam.com/Books/search?q=Stephen Knapp. Not Feeling the Bliss of Spiritual Life? Here's the Cure, this explains how to experience or regain the bliss and ecstasy in spiritual life by attaining the right mood in your service attitude, and why it works. What We Should be Thankful for About India, explains how India's ability to persevere, its flexibility and culture has preserved India's ability to thrive, which it and its people are doing now that it has its independence and freedom from what some people call its years of slavery to invaders, but now how it must choose its destiny carefully after learning the lessons of the past. Krishna--The Ever-Loving God explains how Krishna is always loving toward everyone, but reciprocates with His devotees according to the love they have for Him. Krishna's Eternal Spiritual Abode--Our Ultimate Goal explains a little about the spiritual abode of Lord Krishna, which is our ultimate home and goal. Mantra-Yoga: A Necessity for this Age explains how mantras work and how they are the best technique for spiritual realization in this age. The Beauty of Lord Krishna explains the many beautiful characteristics and qualities of Lord Krishna, and how He is the origin of all beauty. Strong Hindu Families for Strong Hindu Youth explains how when Hindu families are strong and dedicated to their culture, the children are also likely to be strong to their Hindu identity, and how to accomplish that. How to Understand God explains the process by which we can understand the nature of God. How Lord Krishna is the Source of all Avatars: The Expansions of the Supreme explains how all expansions or incarnations of Lord Vishnu can be traced to Lord Krishna. Adding Innovation, Wisdom and Holistic Human Development to Our Universities, This article shows how it is beneficial when students in pre-school, or even in school and universities, include studies in the Dharmic traditions for reaching the higher potential in human development. United Hindu Identity United Hindu Cooperation, explains the need and benefits for Hindus to cooperate together which becomes easy when based on a united Hindu identity. Kurukshetra: A Short Visitor's Guide to the Holy Town, describes the many places to see that are associated with Lord Krishna, or the Bhagavad-gita which was spoken by Lord Krishna, or incidents in the Mahabharata. Bhagavad-gita's Ultimate Purpose shows what is the ultimate goal that Lord Krishna emphasizes in the recurring theme that appears several times throughout the Gita. This is the essential conclusion of all Vedanta. The Ramayana on the Need for a Proper Leader shows how the ancient Vedic literature is still relevant today, in this case by showing the symptoms that we see so much of today when there is no leader, or no qualified leader. It then also shows the ways that a king or leader of a land should act in order to protect the citizens and provide the means for them to live peacefully and reach the real goal of life. Ganesh describes the characteristics and symbolism of Ganesh, and why we worship Him. Lord Krishna Descends to Reestablish Vedic Culture explains why Lord Krishna descends into this world, His main purpose, and how after Vedic dharma had disappeared from the face of the earth, He came to reestablish it, all of which is explained in the Vedic texts and Bhagavad-gita. These free e-booklets are meant not only for reading here online, but you can also download and read them on your own computer, or share them and email them to others, as is the case with most of the articles on this site. This way we can spread free spiritual knowledge throughout the internet, especially to those who may need a better understanding of Vedic culture. All of these are now available as Microsoft Word or Adobe .pdf files and can be emailed to you upon your request so you can format them to your own preferences to be printed and distributed to others as you wish. (45) The Tulasi-devi Handbook: Guidelines and Instructions on the Importance, Care and Worship of the Tulasi Tree. This is a compilation to help anyone successfully grow the Tulasi tree, consisting of: 1. Quotes From Srila Prabhupada, 2. Prayers and Mantras for Tulasi, 3. How to Offer Tulasi Devi Worship (Puja), 4. Tulasi Devi: The Importance of the Sacred Tree, 5. The Marriage of Tulasi and the Significance of Shalagrama-shilas, 6. How to Care for Tulasi, 7. Caring for Tulasi Devi From Seedlings, and 8. Picture Pages that illustrate some of the instructions on caring for the Tulasi tree. Also available as a pdf file for easy use and reading. Along with the above booklet, we also have "Growing Organic Tulasi Indoors" by Bhakta Patrick who gives a thorough and updated explanation of how to grow the sacred Tulasi Tree in an organic environment. This can provide more advice on what to do, including: Basic Plant Anatomy, Organic vs. Inorganic, Obtaining a Tulasi Plant, Caring for Young Seedlings, Soil, Watering, Lights, Nutrients, Pests, Collecting Leaves, Transplanting, Supplies List, and more. 1. Karma: What Is It? 2. Reincarnation: A Simple Explanation, 3. Vedic Description of the Soul, 4. Why Be Vegetarian, 5. 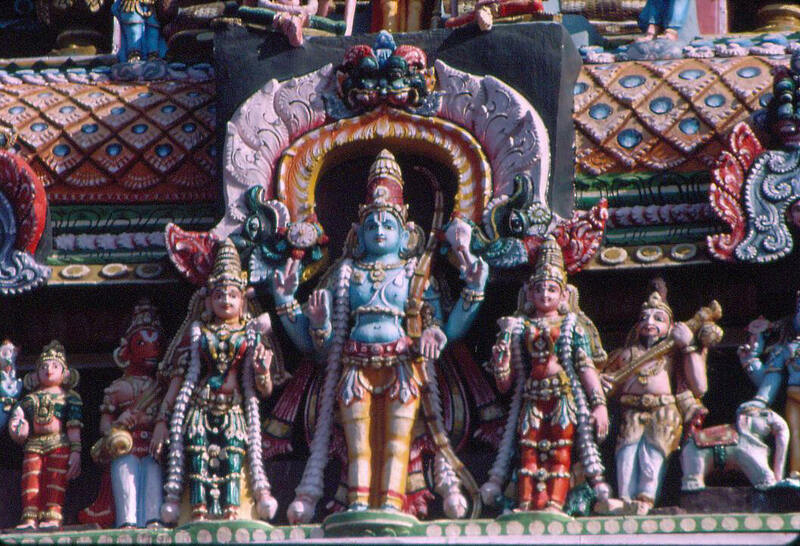 Vedic Culture: As Relevant Today As Ever, 6. Who Is Krishna? 7. The Significance of Deities and Deity Worship, 8. Prasada: The Power of Sacred Food, 9. What is the Hare Krishna Movement, 10. Who is Srila Prabhupada, 11. Welcome to Our Krishna Temple, 12. 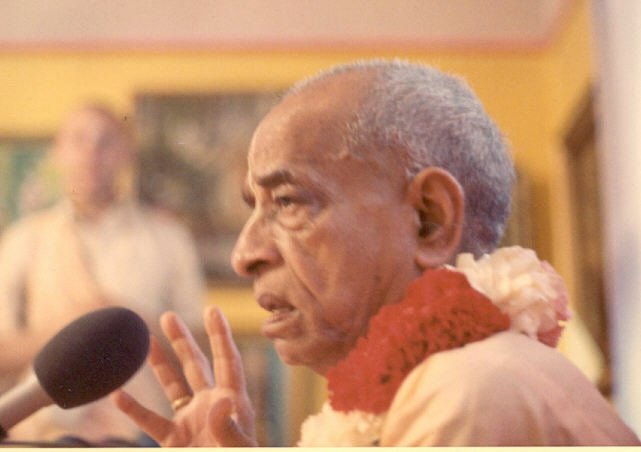 On Chanting Hare Krishna (by Srila Prabhupada), 13. The Peace Formula (by Srila Prabhupada). Articles to Read provides many samples of Stephen's writings and information on a wide range of interesting topics. There is something for everyone. They are all listed alphabetically on the "Articles to Read" page with short descriptions of each. A list of articles and quick links to most of them is provided on the left. These include excerpts from Stephen's books as well as introductions to the many answers to questions about life that the Eastern and Vedic philosophy contain. They are offered in two parts: PART ONE provides a diverse selection for both beginners and advanced on numerous aspects of Vedic understanding, and PART TWO includes items that focus on particular issues dealing more specifically with Hinduism and India. Do All Christians Go to Heaven? Hare Krishna, Hare Krishna, What's so Special About Chanting Hare Krishna? Jesus Predicted in the Vedic Literature? Mohammed: Is He Really Predicted in the Bhavishya Purana? Moksha / Liberation: What is It? The World Relief Network publishes most of Stephen's books and are located at: P. O. Box 15082, Detroit, Michigan 48215--0082 U.S.A. Further information about them and what their mission is also provided through this link. JOIN STEPHEN'S NEWS LIST to keep informed of his future publications of books, articles and activities, as well as occasional but most interesting updates in news and views on spiritual development, Sanatana-dharma, the preservation and protection of Vedic culture, developments in spiritual organizations and communities, or other behind-the-scenes items outside the mainstream news coverage to see what is really going on, and sometimes articles by other noteworthy writers that are not on the website. Book Reviews allows you to check what others have said about his books. Stephen has put the culmination of over thirty years of continuous research and travel experience into his books in an effort to share it with those who are also looking for higher levels of spiritual understanding. Many people and seekers of spiritual truth have appreciated the important insights they have received from his books. More information about Stephen is provided below. Reviews about this Website offers thoughts and appreciations of others who have visited this site. Seeing Spiritual India provides an introduction to traveling to the holy places of India with links to a large selection of color photos taken by Stephen. This provides many interesting and beautiful views of the country, holy sites, major festivals, and its people. This is also listed as one of the "Articles." Anyone who loves traveling or who wants to see more of India will like this. Many other black & white photographs and information about how to travel to the holy sites in India can be found in his books. https://picasaweb.google.com/101334555585436300096/ under the name of Sri Nanda Baba. 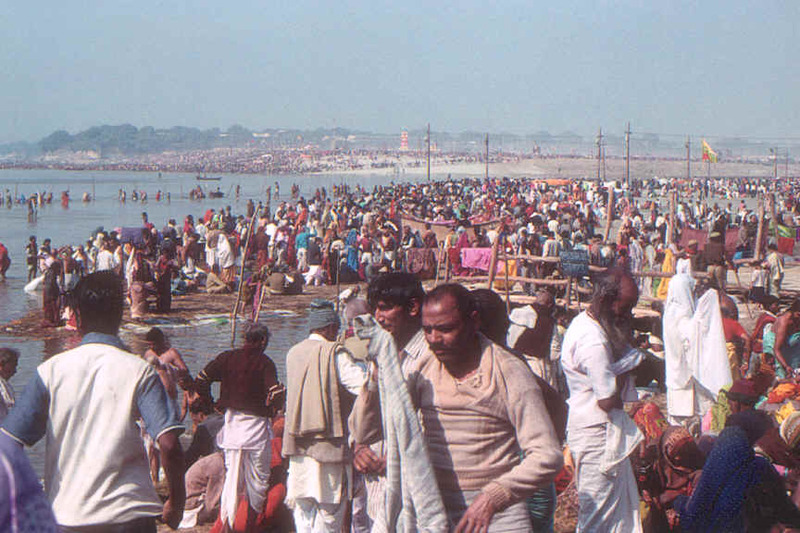 The Kumbha Mela 2001 relates background information and Stephen's personal experience of this incredible and huge festival. It is the largest spiritual gathering of people in the history of the world, with over 70 million people attending from all over. It also saw an amazing increase in Westerners, even famous movie stars, curious to see what the Mela is all about. Why is this festival so unique? Why does it attract so many people? What are its benefits? And what happens at this festival? You can find out the answers through the fascinating articles and photographs that are listed. VIDEOS: Introductory and Travel, by Stephen Knapp. These offer introductions into various topics and traditions of Vedic culture in videos for those who prefer to view either lectures, events, customs through videos. 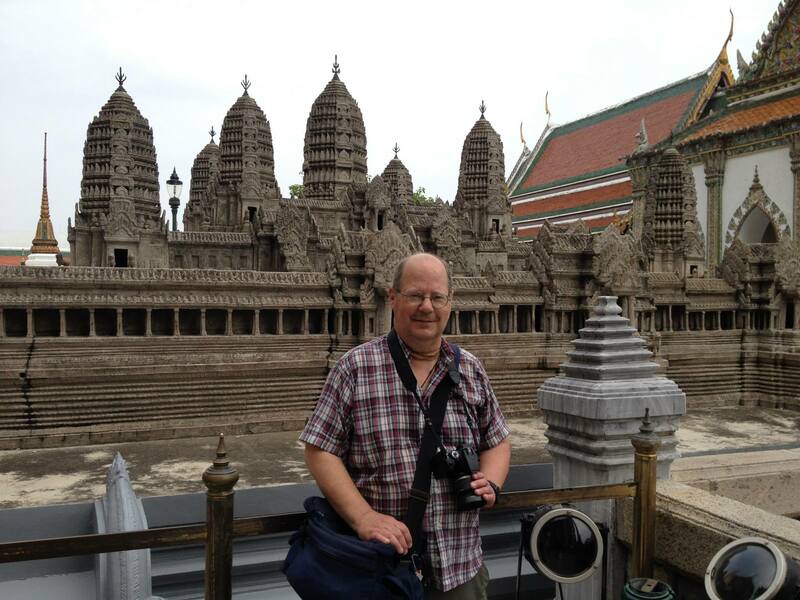 There are also a number of travel videos to places Stephen has visited which show some of the holy places through moving video. Check out the page to see what topics and holy places or festivals are offered. 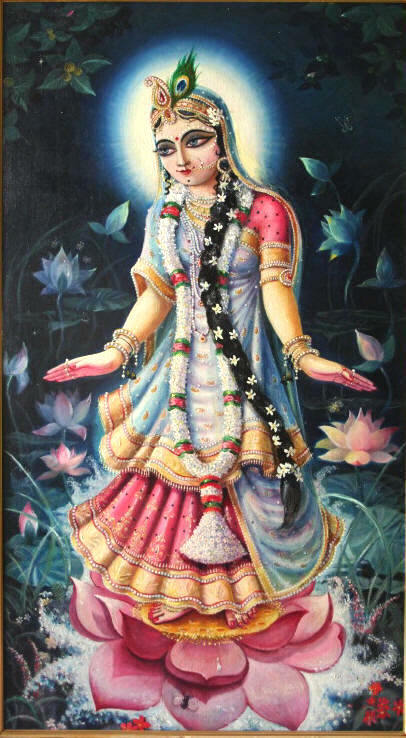 The Krishna Darshan Art Gallery offers a wide collection of numerous images, including a selection of photographs of lovely Krishna Deities from around the world, some of which are rare, along with a variety of beautiful paintings, and prints of Krishna pastimes, many of which can also be used for your home altar. This provides views into the spiritual world and helps our meditation and devotion. 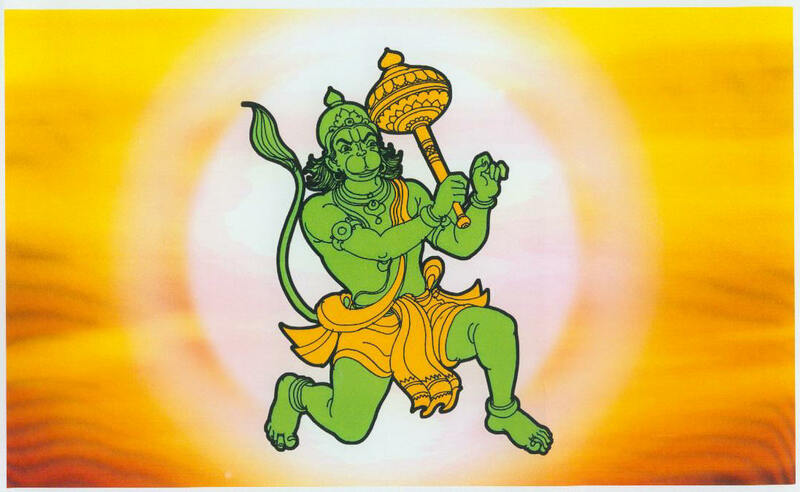 Access to additional prints of Vishnu, Lakshmi, Ramachandra, Hanuman, Shiva, Ganesh, and others are also available here. The Prabhupada Photo Gallery is also accessed through the Krishna Darshan Art Gallery or simply by clicking this link. It contains over 140 never before published photographs of His Divine Grace Srila A. C. Bhaktivedanta Prabhupada in three collections, showing Prabhupada in a variety of settings and places. 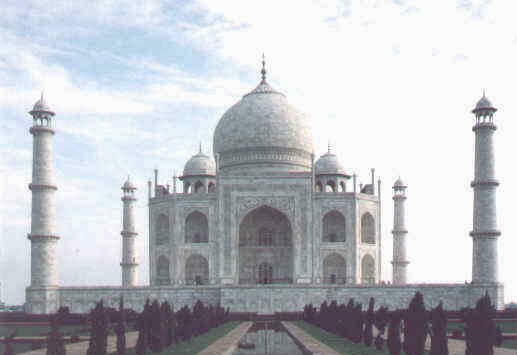 Was the Taj Mahal a Vedic Temple? The Photographic Evidence This is a special page that presents two collections of photographs: one that belonged to the Archaeology Survey of India and another private collection, both of which show the Vedic influence in the Taj Mahal and other buildings that lead to the idea that they were originally Vedic temples and palaces. It also presents the Vedic influence in old drawings and art from elsewhere in the world. Even if you do not accept all of this information, it makes for an extremely fascinating story. Other articles are also available through this page that provide additional evidence. Directories of Temples, Ashramas and Spiritual Organizations from around the world are now provided in response to people who have inquired about where there might be temples or centers near them. Such places are where they can continue their study or associate with similarly interested people. And if you can't find anyone near you, you can always write to Stephen, so Stay in Touch. Vegetarian Recipes and Resources is a page that provides all you need to get started or expand your ability to be vegetarian or assist others in becoming one, and the reasons for it. You get access to a large selection of great vegetarian recipes, cookbooks you can print and use now, and over 65 links to additional cookbooks and recipes, supplies, meat and egg substitutes, leather-free shoes & clothing, vegetarian restaurant directories, and information on being a vegetarian, including the health, environmental and spiritual benefits. 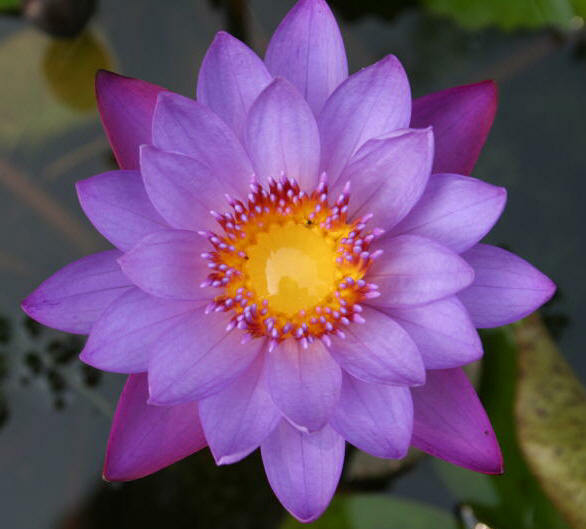 A Little Book of Prayers, Mantras & Gayatris A great source of nectar, this offers a variety of powerful prayers, such as for giving thanks, asking for protection, seeking higher levels of guidance, or our need for acquiring deeper feelings of love for God. Divided into 21 sections, these prayers also offer profound insights or windows into the spiritual dimension, and are thus great vehicles for our meditation on the Absolute Truth and the spiritual world. Some of what is included are Prayers to Radha and Krishna, the Brahma-samhita, Purusha Suktam, Sri Suktam, Isha Upanishad, Nrisimha Kavacha, the Sri Vishnu Sahasranam, and many other mantras, gayatris and songs to the Supreme, His incarnations, to Goddess Lakshmi, and others like Shiva and Devi and the demigods, and to the planets for assistance. Also has the words to all the standard songs used in the programs of most Hare Krishna temples. Recent Archeological Finds Confirming Vedic History is a project in which we list some of the most noteworthy archeological finds of the past few years that confirm the Vedic descriptions of world history. Other pages include new developments or research on the Sarasvati River, the findings and history of Ayodhya and the temple of Lord Rama, and photos of Adam's Bridge, the ancient link between Ramesvaram and Sri Lanka. We will continue to update this information as new discoveries are found, or as additional news is sent in to us. Links to other websites lists over 300 sites for more helpful information and news about India and its Vedic culture, yoga, spiritual groups, temples, current events and issues, sites for children, government related sites, organizations, or access to other spiritual books and resources for enhancing your spiritual adventure and progress, and research, plus links for travel information, Indian groceries, and much more. Jokes and Anecdotes OK, so most of this web site contains material of a serious nature. So now let us lighten things up a bit with some laughter. Sometimes this world just does not present enough opportunity for humor, so you have to make it when you can. How You Can Help shows the ways in which you can assist in Stephen's work of preserving, protecting and promoting the genuine spirituality as found in the Vedic tradition. So if you have liked and appreciated what you see in this website, and want to help in how we can keep this work going, here are some things you can do. Please spend some time here and be sure to mark this website for future reference and assistance. We will be adding more information and resources on a regular basis. It is our pleasure to serve you in this way. This is why we are here. Stephen has dedicated himself to spreading the deepest and most practical levels of spiritual knowledge about the soul--our real identity. 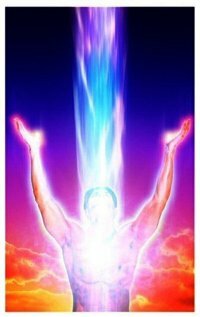 It is his strongest realization that our existence on this earthly plane becomes much easier and more vibrant the more we expand our spiritual awareness to perceive the higher dimensions and purpose of things around us. It is through this means that we can discover who we are and get a better understanding of what is our position in this universe and our relationship with God. Fortunately, many of the answers to the numerous questions in this regard have already been given, as seen in the ancient spiritual texts of the East. These have provided not only the insights but also the timeless methods for our continued spiritual development. Stephen has studied these numerous ancient texts and practiced the methods prescribed therein for over 40 years. He is now presenting this enlightening information in a much needed, concise, and easy to read format. Stephen Knapp grew up in a Christian family, during which time he seriously studied the Bible to understand its teachings. In his late teenage years, however, he sought answers to questions not easily explained in Christian theology. So, he began to search through other religions and philosophies from around the world and started to find the answers for which he was looking. He also studied a variety of occult sciences, ancient mythology, mysticism, yoga, and the spiritual teachings of the East. Finally, after his first reading of the Bhagavad-gita, the classic summary of Vedic philosophy known as The Song of God, he felt he had found the last piece of the puzzle he had been putting together through all of his research. This increased his understanding of everything else he had been studying. Therefore, he continued to research all of the major Vedic texts of India to gain a better understanding of the Vedic science, until he became a full-fledged follower and practitioner of Sanatana-dharma. Now he also tirelessly works to protect, preserve and promote the deep spiritual knowledge of Vedic philosophy and its traditions. An introduction to his research, writing and projects can be found at his website: www.stephen-knapp.com or http://stephenknapp.info. Besides being brahminically initiated and being trained in temple pujas, Stephen has also been to India numerous times and traveled extensively throughout the country, visiting almost every state of India and most of the major holy places and temples, and many minor ones, and gaining a wide variety of spiritual experiences that only such places can give. His knowledge of India and familiarity with traveling in such a diverse country has made him an advisor for those who would like information concerning their own journeys to India. Stephen is also a free-lance photographer and does what he calls cultural photojournalism, capturing the essence of India and spiritual life in practice, which can help explain and show the depth of the culture, and has put together a collection of over 18,000 slides of various places, festivals, and the people of India. He enjoys giving slide shows on the holy places, and mixing photos with philosophy. You can see samples of his photography on this website. Stephen continues to travel to India on a regular basis, giving lectures on the benefits and glories of the Vedic tradition. His life is dedicated to spreading the eternal knowledge of the soul, Sanatana-dharma, and highlighting the Vedic teachings to help everyone get a better understanding of themselves and bring everyone closer to God. He has especially focused on the sadhana of bhakti-yoga and mantra-yoga to purify the mind and consciousness, and awake one's love for the Supreme Being. Stephen is also the founder of the World Relief Network. Its goal is to help relieve the sorrow, suffering and confusion on the planet by the dissemination of genuine spiritual knowledge and the means for individual and social enlightenment, and to work with others who feel the same. Many of his books are published through the World Relief Network. 1. "The Secret Teachings of the Vedas,"
2. "The Universal Path to Enlightenment,"
4. "How the Universe was Created and Our Purpose In It,"
5. "Toward World Peace: Seeing the Unity Between Us All,"
6. "The Key to Real Happiness,"
7. "Proof of Vedic Culture's Global Existence,"
8. "Facing Death: Welcoming the Afterlife,"
10. "The Heart of Hinduism: The Eastern Path to Freedom, Empowerment and Illumination,"
11. "The Power of the Dharma: An Introduction to Hinduism and Vedic Culture,"
12. "The Eleventh Commandment: the Next Step for Social Spiritual Development,"
13. 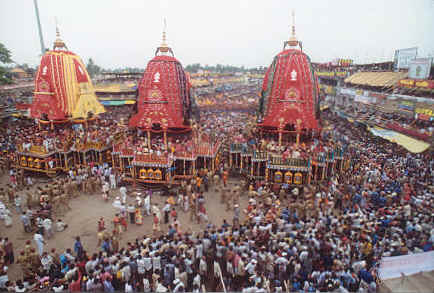 "Seeing Spiritual India" A Guide to Temples, Holy Sites, Festivals and Traditions,"
14. "Crimes Against India: And the Need to Protect its Ancient Vedic Traditions,"
16. "Yoga and Meditation: Their Real Purpose and How to Get Started,"
17. "Avatars, Gods and Goddesses of Vedic Culture: Understanding the Characteristics, Powers and Positions of the Hindu Divinities,"
18. "The Soul: Understanding Our Real Identity,"
20. "Prayers, Mantras and Gayatris: A Collection for Insights, Protection, Spiritual Growth, and Many Other Blessings,"
21. "Krishna Deities and Their Miracles: How the Images of Lord Krishna Interact with Their Devotees,"
22. "Defending Vedic Dharma: Tackling the Issues to Make a Difference,"
23. "Advancements of Ancient India's Vedic Culture,"
24. "Spreading Vedic Traditions Through Temples,"
26. 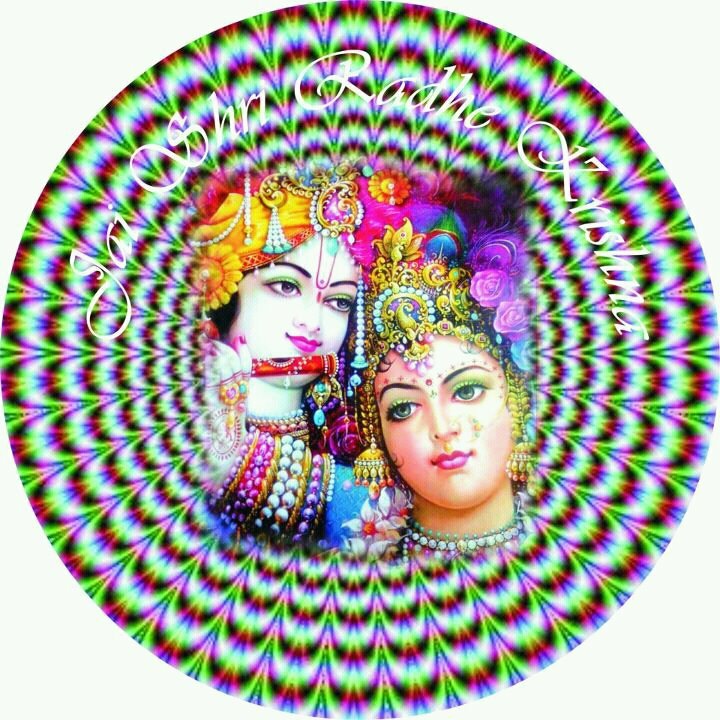 "Lord Krishna and His Essential Teachings,"
27. "Mysteries of the Ancient Vedic Empire,"
29. "Ancient History of Vedic Culture,"
30. "A Complete Review of the Vedic Literature,"
31. 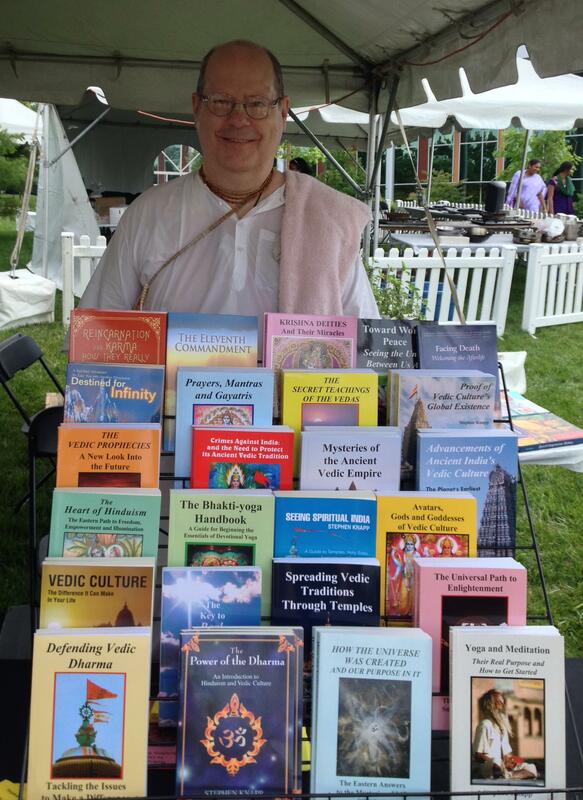 "Bhakti-Yoga: The Easy Path of Devotional Yoga," along with additional booklets on his website. Stephen has put the culmination of over forty years of continuous research, sadhana practice and travel experience into his books in an effort to share it with those who are also looking for higher levels of spiritual understanding. Full descriptions of all of his books, plus numerous articles he has written, and many more resources can be found here on his website. More books are forthcoming, so check back to his website for any new developments. Stephen also worked in home health care for a few years and has experience in assisting with those who are departing from this world through the dying process. He has also counseled people in their loss of friends and relatives to help them understand that death is not a tragedy but only a process that can help us reach our destiny. With his insights and philosophical background, he has the qualifications and understanding to provide a most unique and uplifting view of the natural transition called death and how it can be used for our benefit. For this reason he has written his book, "Facing Death: Welcoming the Afterlife" to help others understand how to cope with death. Stephen continues to travel to India on a regular basis, and also gives lectures on the benefits and glories of the Vedic tradition. 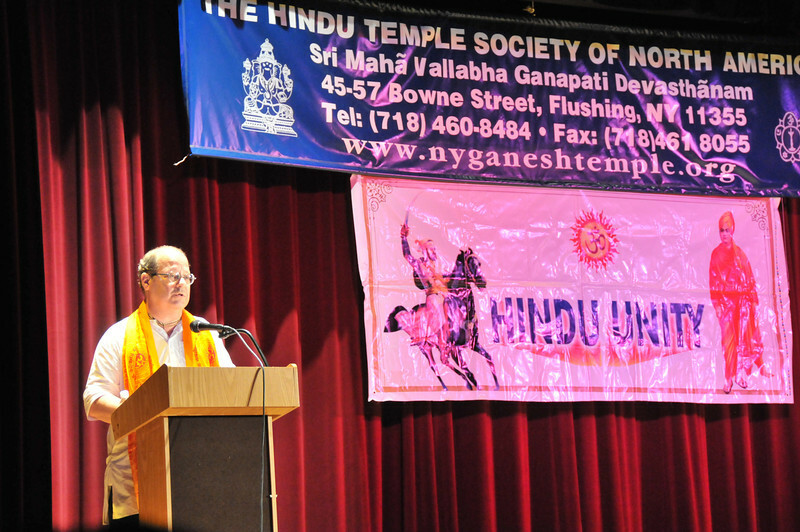 He was a lecturer at the Global Dharma Conference in Edison, New Jersey in 2003, and has given lectures for other Vedic or Hindu student college organizations, as well as at HSS camps, VHPA camps, the Hindu Mandir Executive Conferences, the WAVES conference in Houston in 2006 & 2011, Hindu Heritage Day in Cincinnati in October of 2005, and in temples or personal home gatherings and Gita groups. He was also one of the lecturers at the 17th Telegu Association of North America conference in 2009, for which he received an award for "Significant Contributions to Spirituality and Hinduism," and also gave the keynote lecture at the Hindu Unity Day Festival in New York in July, 2011. He continues to speak on television and radio shows, and give presentations at conferences where invited. Those who are interested can contact him for scheduling arrangements. He also enjoys showing selections from the more than 18,000 slides that he has of his travels throughout India and the many historical and spiritual sites in India and Nepal, or the amazing festivals he has attended, such as the Kumbha Mela or the Ratha Yatra in Jagannatha Puri. For a Complete CV of Stephen Knapp, CLICK HERE. For A Few Letters of Appreciation for Lectures Given, CLICK HERE. For Photos of Stephen While Lecturing CLICK HERE. 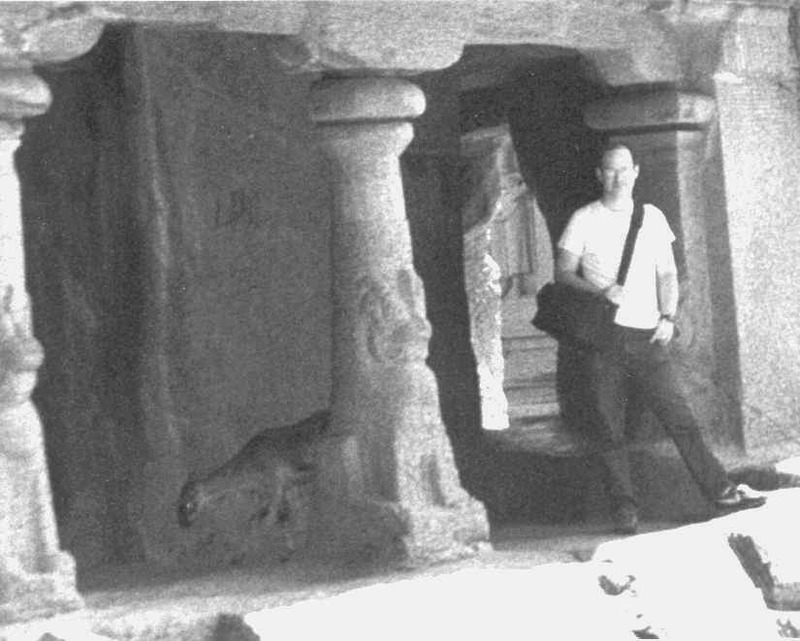 Stephen is shown below during his travels at one of the five small stone temples called the Five Rathas at Mahabalipuram, now known as Mamallapuram, in Southern India. 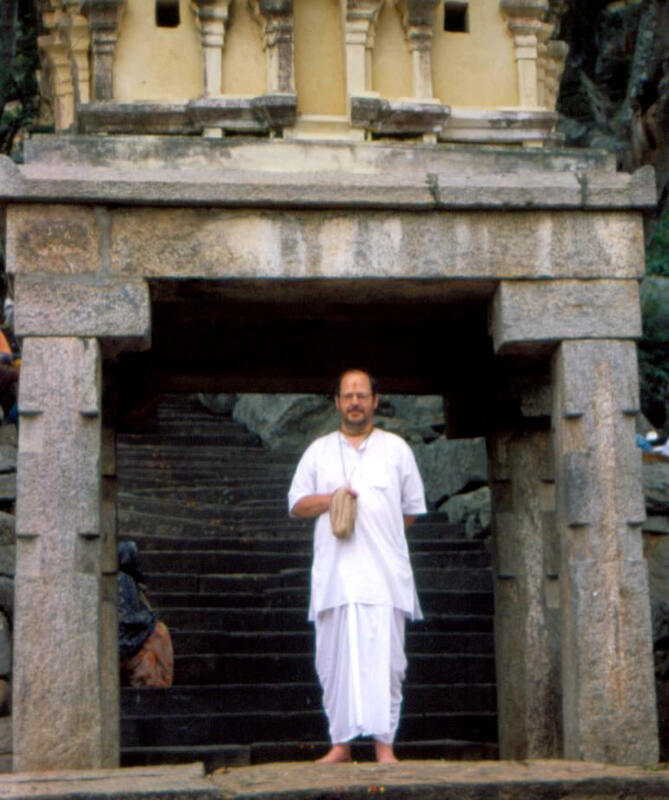 Below: Stephen is shown in traditional Indian clothes of dhoti and kurta, standing on the stairway that leads up to the ancient Narasimha temple in Melkote, South India. The Narasimha Deity there is said to have been installed by Lord Narasimha's most elevated devotee, Prahlada Maharaja himself. A photo of this Deity can be viewed HERE. We hope that this site and the information and books found here can be or have been of help to you. Check back since we are always adding new items to this site. Thank you for any support or encouragement. Helping people on their spiritual path is why we are here.